SINGAPORE - Singapore is now the 24th most expensive location in the world for expatriates, falling from 18th place last year. The Republic, however, retained its 10th place in regional rankings. This is according to the latest Cost of Living survey published by ECA International. "Prices have risen in Singapore since our last survey," said Mr Lee Quane, ECA International's regional director for Asia. "Therefore, in local currency terms, expatriates in Singapore will clearly have felt an increase in their cost of living in the past 12 months." "However, as the Singapore dollar has depreciated against many currencies over the course of the last year, this has made the cost of living cheaper relative to several other locations than it was a year ago." While Singapore and Malaysian cities have fallen in the global rankings, the gap between Singapore's cost of living and Kuala Lumpur's has increased over the past 12 months, the survey also noted. Kuala Lumpur fell by 15 places to 212th position. Both George Town and Johor Baru dropped by 10 spots to 245th and 250th respectively - out of the 262 locations globally. "The continued weakness of the Malaysian ringgit is responsible for Kuala Lumpur's decline in the rankings, as well as Johor Baru's status as the location with the second-lowest cost of living in the region," said Mr Quane. "Cities in Malaysia continue to rank among those with the lowest cost of living for international assignees in the world, and have even become marginally cheaper over the past five years." ECA International carries out two main cost of living surveys per year to help companies calculate cost of living allowances so that their employees' spending power is not compromised while on overseas posting. The surveys compare a basket of like-for-like consumer goods and services commonly purchased by expats in over 460 locations worldwide. The basket does not include certain living costs - such as accommodation rental, utilities, car purchases and school fees - as these are usually covered by separate allowances, said ECA International. Hong Kong is the Asia-Pacific region's most expensive location for expatriates, up one place from second place last year. Globally, it moved up seven places to become the second-most expensive location for expatriates - its highest-ever rankings on both fronts. "Hong Kong has continued to get more expensive for expatriates," said Mr Quane. "Over the past few years, the HK dollar has appreciated against most major currencies, owing to its peg to the US dollar, which has pushed up the price of goods and services relative to those in locations whose currencies have weakened against the greenback." Tokyo fell by one place to second-most expensive location in Asia. All other ranked locations in Japan maintained their positions in the regional rankings. "Prices in Japan have remained stable over the past year. The yen, on the other hand, has weakened against most major currencies, contributing to the decline of Japanese cities in our rankings," explained Mr Quane. 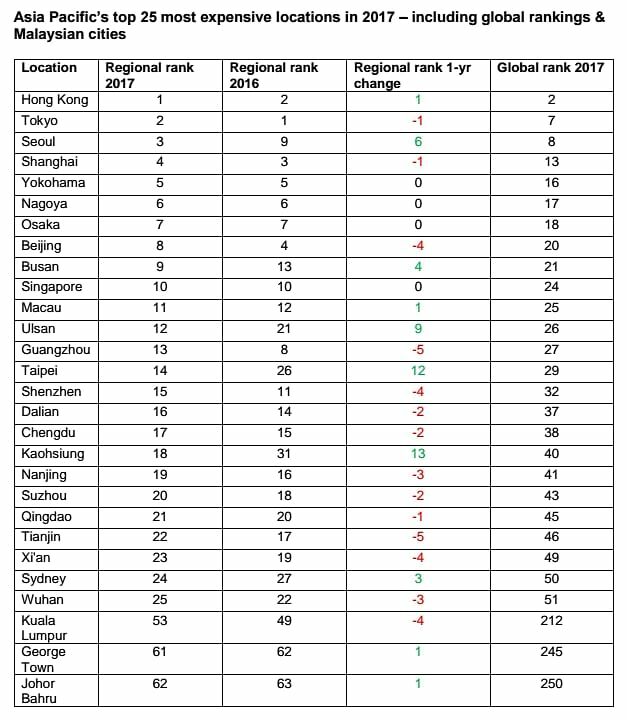 Elsewhere, Taiwanese cities have been the highest climbers in the regional rankings, with Kaohsiung rising the most in the region from 31st to 18th this year. Ulaanbaatar, Mongolia, remains the cheapest location in the region followed by cities in Malaysia and Myanmar. "Much of the movement in the rankings among Asian locations in the past 12 months has been strongly influenced by currency movements, with Yangon falling in the regional rankings on account of depreciation of its currency in the past year," added Mr Quane. Sydney remains the most expensive city in Australia. It currently ranks 50th in the global rankings, up from 70th place last year. All ranked locations within Australia rose in the global rankings this year, with Adelaide rising the most, by 34 places to 75th position - although it is still the cheapest ranked location Down Under. Thanks to the weak pound, central London tumbled 67 places out of the global top 100. It is now the 132nd-most expensive location in the world for expatriates - cheaper than Bangkok, Rio de Janeiro and Buenos Aires, as well as its European rivals Paris, Berlin and Brussels. Luanda, the capital city of African nation Angola, rose from eighth place last year to top the global rankings this year. The costs of goods typically purchased by expats in Luanda, which were already high due to poor infrastructure and high oil-fuelled demand, have been pushed much higher in the last year, said the report. The Angolan kwanza is increasingly overvalued, which pushes up relative costs; while the continued weakness of the black-market exchange rate has also inflated the price of imported goods, the report added.